Perfect projection projector stand tripod type powder coated stand in adjustable height from 3feets to 5feets with powder coated plate in the top of stand which tighten via screw over whom projector will place. Tilting adjustment 60° up and down. 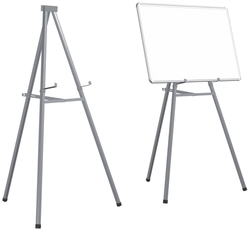 With a main aim to accomplish high level of patron trust, we have been engrossed in providing a vast assortment of Board Stand. We are offering Lifting Tripod to our clients. - A rigid & sturdy tripod, designed for lifting items from below ground level, such as pumps etc. from man holes. - Simple to errect and comes complete with a shackle for easy suspension of a chain pulley block. - Capacity : 500 TO 2000 kg. FS08-22T is constructed with solid steel. This universal TV Cart/mobile TV Stand with mount fits most 32"-55" Flat and Curved Panel LED, LCD, and Plasma TVs. VESA size-max 400x400mm. Perfect for any angle of viewing. We have emerged as a prominent firm, occupied in providing an extensive series of Tripod Stand. We offer this at nominal costs. To furnish the varying desires of our customers, we are immersed in offering a world class consignment of Professional Video Tripod. Floor Standing with a Overall extended Height of 1680 MM are on Desk or Table Top. Sturdy Steel Tripod Stand with telescope adjustable Stand. - 100% Brand new and high quality IMPORTED! - Our portable flexible mini octopus tripod adjustable camera holder is a great way to capture any recording with your mobile or camera, taking the video or photo snap in any angle.